Pioneer of lipreading for deaf-mutes in England; born in Rotterdam June 11, 1845. 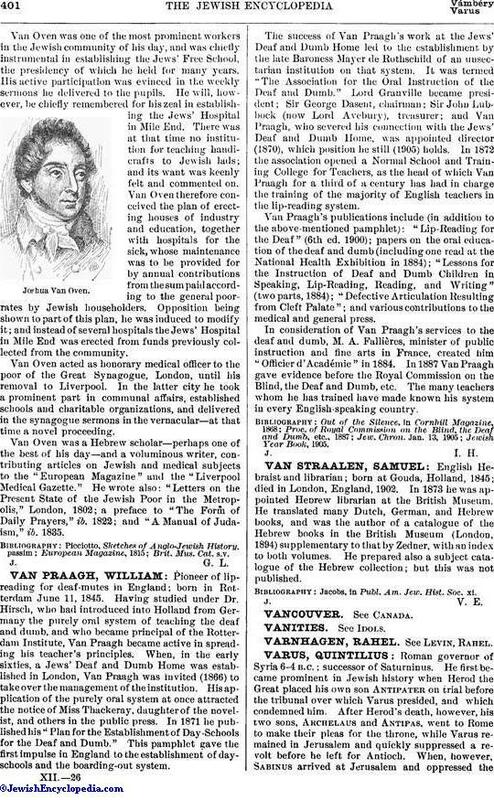 Having studied under Dr. Hirsch, who had introduced into Holland from Germany the purely oral system of teaching the deaf and dumb, and who became principal of the Rotterdam Institute, Van Praagh became active in spreading his teacher's principles. When, in the early sixties, a Jews' Deaf and Dumb Home was established in London, Van Praagh was invited (1866) to take over the management of the institution. His application of the purely oral system at once attracted the notice of Miss Thackeray, daughter of the novelist, and others in the public press. In 1871 he published his "Plan for the Establishment of Day-Schools for the Deaf and Dumb." This pamphlet gave the first impulse in England to the establishment of day-schools and the boarding-out system. The success of Van Praagh's work at the Jews' Deaf and Dumb Home led to the establishment by the late Baroness Mayer de Rothschild of an unsectarian institution on that system. It was termed "The Association for the Oral Instruction of the Deaf and Dumb." Lord Granville became president; Sir George Dasent, chairman; Sir John Lubbock (now Lord Avebury), treasurer; and Van Praagh, who severed his connection with the Jews' Deaf and Dumb Home, was appointed director (1870), which position he still (1905) holds. In 1872 the association opened a Normal School and Training College for Teachers, as the head of which Van Praagh for a third of a century has had in charge the training of the majority of English teachers in the lip-reading system. Van Praagh's publications include (in addition to the above-mentioned pamphlet): "Lip-Reading for the Deaf" (6th ed. 1900); papers on the oral education of the deaf and dumb (including one read at the National Health Exhibition in 1884); "Lessons for the Instruction of Deaf and Dumb Children in Speaking, Lip-Reading, Reading, and Writing" (two parts, 1884); "Defective Articulation Resulting from Cleft Palate"; and various contributions to the medical and general press. In consideration of Van Praagh's services to the deaf and dumb, M. A. Fallières, minister of public instruction and fine arts in France, created him "Officier d'Académie" in 1884. In 1887 Van Praagh gave evidence before the Royal Commission on the Blind, the Deaf and Dumb, etc. The many teachers whom he has trained have made known his system in every English-speaking country.